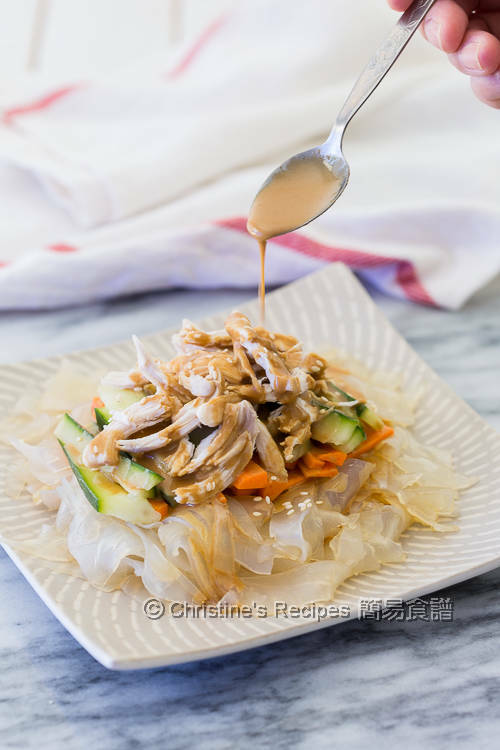 This is my take on the delicious shredded chicken with sesame sauce, that I tried at a Shanghai noodle shop in Hong Kong. It’s served cold, very refreshing. The shredded chicken meat was so tender and moist. The sesame sauce was very aromatic and intriguing me to dig into the dish until it’s finished. It’s an appetizer actually. I replicated that dish and added some noodles, turning it into a light meal. The noodles I used are made of green bean starch. You can easily find it in any Asian grocers. Simply blanch the starch sheets in boiling water for a few minutes, then cut them into noodle-like strips. They look like flat rice noodles (hor-fen, 河粉 in Chinese). But the texture of it is firmer. In a small pan, pour in the chicken stock. Add the star anise. Bring it to boil over medium heat. Add in the chicken. Cook for 15 minutes, or until it’s cooked through. Drain up. Shred it with two forks. Season with salt and pepper. Set aside. 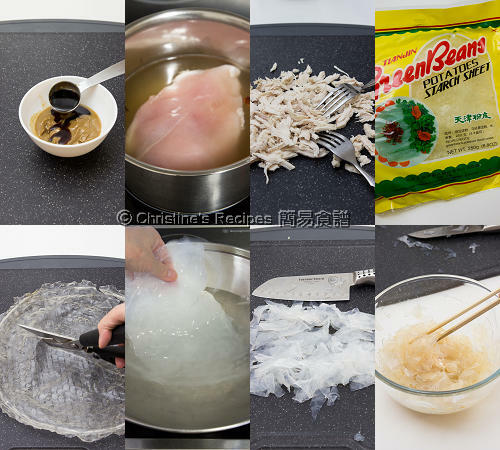 If your green bean starch sheet is quite large as mine, you may cut it into 4 portions with a pair of scissors. That will make it easier to handle. Soak in water until softened. Cook in boiling water for 2 to 3 minutes, until it becomes transparent. Drain up. Cut into strips, like noodles. Transfer into a large mixing bowl. Season with fish sauce, light soy sauce, minced garlic and sesame oil. Mix well. To assemble: Put the seasoned green bean starch noodles on a serving plate. 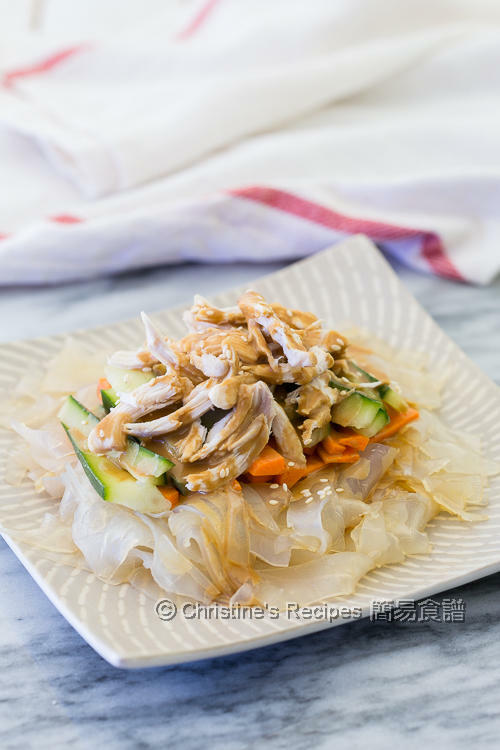 Place cucumber, carrot and shredded chicken on top. Drizzle sesame sauce. Garnish with sesame seeds. Enjoy! Don’t discard the chicken stock. You can save it for making other dishes. This dish can be served cold. Get all the ingredients ready ahead and chill in fridge. You can assemble the ingredients and drizzle sesame sauce in the last minute before serving. This is my kind of meal, Christine. I miss those green bean noodles.